Paul Downes offers a radical revision of some of the most cherished elements of early American cultural identity. The founding texts and writers of the Republic, he claims, did not wholly displace what they claimed to oppose. Instead, Downes argues, the entire construction of a Republican public sphere actually borrowed and adapted central features of Monarchical rule. 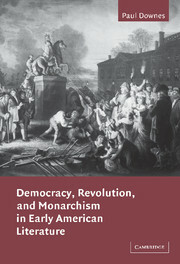 Downes discovers this theme not only in a wide range of American novels, but also in readings of a variety of political documents that created the philosophical culture of the American revolutionary period. Preface; Acknowledgements; Introduction: the spell of democracy; 1. Monarchophobia: reading the mock executions of 1776; 2. Crèvecoeur's revolutionary loyalism; 3. Citizen subjects: the memoirs of Stephen Burroughs and Benjamin Franklin; 4. An epistemology of the ballot box: Brockden Brown's secrets; 5. Luxury, effeminacy, corruption: Irving and the gender of democracy; Afterword: the revolution's last word; Notes, Bibliography; Index.